Those videos yesterday of the prime minister answering journalists’ questions on the state of play of the investigations into the assassination of Daphne Caruana Galizia are profoundly disturbing. This one is from Lovin’ Malta’s YouTube channel. This is really not the occasion for the prime minister to give us all a patronising, knowing look and to tell us that for our own good we should not be asking too many questions. Although in view of their manifest loyalty to Joseph Muscat, I would still struggle to accept it, that sort of line would make sense if it was coming from the police or the prosecutor. If these were normal circumstances, you’d have to accept that. It’s the tough pill that relatives of victims have to swallow every time they express frustration with investigators and with prosecutors for not moving against suspected perpetrators. But how is it the prime minister’s place to be giving these reassurances? Why should he know the state of a criminal investigation? Why should the prime minister know more than anyone else who the police think did it and what they’re doing to act on them? His remarks yesterday were entirely out of place. It would have been reasonable for him to say he shares everybody’s impatience. He could have said he has been assured by the responsible authorities that they’re moving on this case, they’re taking it seriously, they have credible leads and they will act once the evidence is in place. After all if we’re asking the question every day, it would make sense for him to ask as well. But Joseph Muscat makes himself the lead investigator and prosecutor in this case and we are reminded of something Silvio Valletta — erstwhile chief investigator in this crime — said in court when justifying his continued participation in this investigation: people in politics cannot be ruled out of this crime. If there’s a name that appears prominently in Daphne Caruana Galizia’s writings of the last several years of her life, that is Joseph Muscat’s. He accuses her of being part of, if not herself concocting, the biggest lie in Maltese political history, and that supposed lie was about him. She made him cry openly in public, although a strategic pinch to his tear glands helped the exercise along. Even now, so many months after her death, he still goes to court to exert revenge on her children for the crime of being her children, demanding their obeisance and prostrate grovelling in exchange for his reluctant magnanimity. How can anyone consider him an uninterested party in this affair? Let us allow ourselves, for the sake of argument, to rule him out of the list of potential suspects and go back to Daphne’s blog and all the people she wrote about and all the people who potentially might have moved to have her eliminated. Think of how many of them are employed by, work for, are in association with or are married to Joseph Muscat. Think how many of those potential suspects could bring him down with them if their link to the assassination is established. Even though we may allow the possibility the assassination came as a surprise to Joseph Muscat, that does not reduce his motivation to ensure potential suspects in its commissioning are protected, merely to save his own political skin. I mean look at the video for crying out loud. Look at the presumably involuntary, nervous smirk on Chris Cardona’s face. He looks like he’d rather be tied to a chair at the mouth of a flowing caldera than in the presence of journalists asking about the state of play of the investigations into the assassination of Daphne Caruana Galizia. At least, surrounded by noxious gases, powdered with pumice and kept warm with a pyroclastic flow, he can laugh and giggle at the memory of the journalist who caught him drunkenly stumbling with his pants around his ankles. 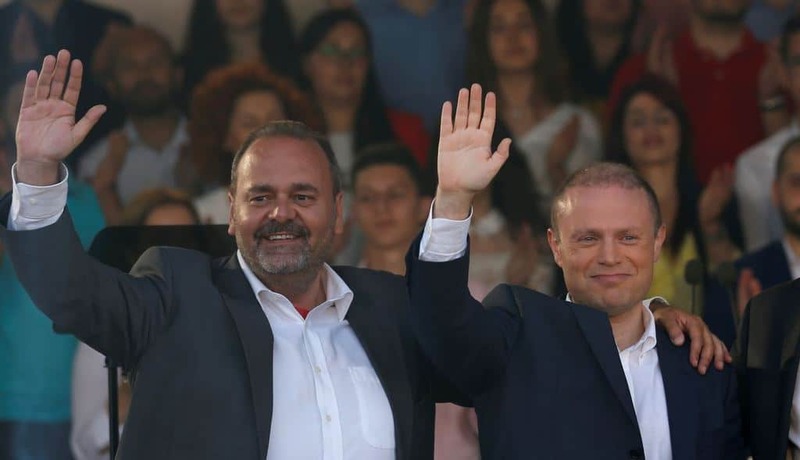 Chris Cardona feels safe right there behind Joseph Muscat’s back. No one is ever going to ask him questions while the prime minister is wearing a cop’s badge.